In 1971, there were many unanswered questions about renal replacement therapies. Dialysis was still much in its infancy with research being done at every level. Ray Duarte a clinical instructor and nurse researcher in private practice began conceptualizing research projects in an attempt to answer some difficult questions specifically regarding purification processes for kidney malfunction. Constantly learning and asking questions, his desire to help patients is noted by many of his colleagues. It is his desire to help his patients that drove him to accomplish so much throughout his life. His first love was to be at the bedside of his patients. 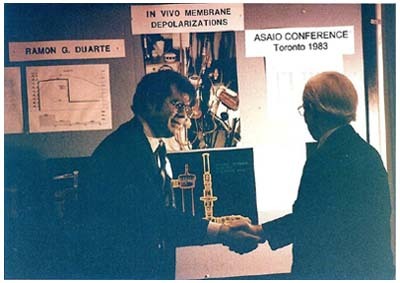 His unquenchable thirst for knowledge coupled with a desire to create ways to better the lives of dialysis patients led him to develop the first in vivo ultrafiltration-rate monitors page 1 page 2, which gave way to the first accurate projected fluid removal techniques. Among his many contributions to those individuals with kidney impairments, Mr. Duarte introduced dialysis triage procedures page 1 triage procedures page 2 for international disasters, and was commended by the Armenian Relief Society for his selfless contributions to the 1988 earthquake relief effort in Armenia. He also published an article, titled “Seismic Risks in Nephrology” which was the first article to appear in global medical publications that connected earthquakes with dialysis. This model has been referenced several times over the years, including in such publications as the New England Journal of Medicine in March 1990. Trained in self-care, home care, in-patient care and acute care hemodialysis, he also solved the problem of concentration polarization of protein molecules in interaction with hemodialyzers. A registered nurse, Mr. Duarte completed coursework at the Los Angeles Valley college school of nursing and holds certification in nephrology nursing from the board of nephrology examiners. In recognition of his professional efforts, Mr. Duarte received several awards throughout his career. He was presented with the Dedicated Services Award by the Hemodialysis foundation, was named Allied Health Professional of the year by the National Kidney Foundation serving Southern California and Southern Nevada, and was nominated for the Scientific Award of the New York Academy of sciences. Mr. Duarte looks forward to a future filled with possibility. In fact, moving ahead, he intends to continue writing and publishing works in healthcare and creative genres. He also plans to maintain his research, thereby assisting patients who must undergo three to four hour dialysis treatments three times a week. “They are the most courageous people I know,” he says. In the last analysis, Ray Duarte, RN, a nephrology specialist and researcher, has published in medical journals and lectured at national medical conferences. One of his articles was referenced in the New England Journal of Medicine. After publishing thirty abstracts and nine manuscripts in his field, he has changed his focus from technical to creative writing. His story "Forever Smile" was published in the New York Times best selling series, Chicken Soup for the Soul - Love Stories (February 2008). Enjoy getting to know Ray better by listening to Radio Interview link at http://www.rayduarte.com/mp3/kbzn-show1-Podcast.mp3.
" As we all watch, listen, and pray, tragedies of earthquakes unfold globally; bringing recollections to Duarte of yet another time which seems to have been more a warning of what could happen to us in California. The earthquake in Haiti and Japan came at a time when his story "Fate Glistens" had just been published as part of an anthology of stories about FATE. "Fate Glistens," a true short story about a moderately strong earthquake that struck the suburb of Los Angeles - Sylmar, California; and how that 6.5 temblor on Tuesday morning, February 9, 1971, impacted Ray and his family. .
His stories written from the heart carry a double-edged sword, because as an author, he writes from his heart, just to see it in print makes him feel that the work is done. However, in reality, his manuscripts been the birth process of countless rewrites reaching a state readable by others. But the second edge of the sword he carries is the story behind the story. Five months after the Sylmar quake, he received his degree in Nursing and his license as a California Registered Nurse. In 1986, He formulated Task force One; to ask and hopefully answer some of the many questions each possible scenario would present. His committee and he met for nearly a year. He then published his article "Seismic Risks in Nephrology" in October of 1988 (Dialysis and Transplantation Magazine, a peer- reviewed publication). On December 7th of the same year, Soviet Armenia shook with a 7.2 magnitude quake—25,000 people died. The realities he had imagined were greater than the fears he had harbored. He put together and readied an airlift response in less than 72 hours after that quake. One plane with 17 dialysis machines, water, generators, lighting, supplies, one surgeon, one nephrologist, 2 dialysis technicians and 4 nurses readied for a flight to Armenia. They knew that dialysis acute care would be required for hundreds buried under tons of concrete, and as they would be extricated after hours of immobilization with crushing injuries causing them to be in kidney failure, only dialysis for most of them would reverse their life-threatening conditions, helping some to survive. Their plane with supplies was accepted by the Soviet Union, but visas were not granted and therefore, Duarte and his team of specialists were denied entry into the Soviet Union. He did not realize at the time, that his article "Seismic Risks in Nephrology" became the first article in Global Medical publications to connect earthquakes with dialysis. It has been referenced several times over the years, including references in the New England Journal of Medicine (March 22 1990).